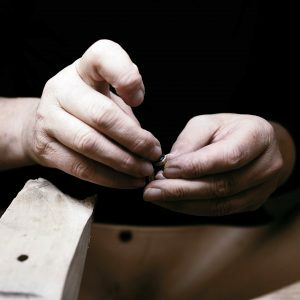 Even the highest quality jewellery, expertly crafted, is still delicate. All precious metals are relatively soft and are subject to wear and tear. Remove your jewellery at home. During your day to day life at home; cooking, cleaning, relaxing, there is very little need to show your jewellery, but it’s where you pick up a large part of wear and tear. Get into the habit of having a safe place to store your jewellery when you get home and take it off. Besides the issue of wear, it also adds to the hygienic cleanliness of items. Don’t swim with your valuables. There’s no need to. You will eventually be unlucky and lose it. If any activity might contribute to unnecessary wear of your jewellery, remove it. Gardening, sports or going to the gym; to name a few. Have your pieces inspected and cleaned by a reputable jeweler as often as possible. At least twice a year for items you wear often. Where viable, rotate your jewellery. Like dress rings, earrings, bracelets and pendants. If you limit extensive wear of an item, you prolong its longevity. This also implies to have more than one necklace. The majority of items can be cleaned at home, using warm water, soap (dishwashing liquid works well) and a scrub with an old tooth brush. Be sure to rinse items in warm water again and in most cases a hair dryer is handy to get rid of moisture. Wipe with a soft cloth. Purchasing a special jewellery wipe is handy. Do some homework before the time (contact Studio 1980 for advice). Pieces containing pearls, gems like opal or tanzanite (and many more) require additional care and might be damaged by procedures others will benefit from. Have your more valuable items appraised once a year. Your insurance might require this and most reputable jewelers will assess the condition of the piece at the same time.